Fences are one of the most challenging landscape elements. People often install fences without first thinking the project through and the less-than-satisfactory results can range from simply inappropriate to downright claustrophobic. Most people use fences to create privacy yet they don’t realize there are different levels of privacy: full, moderate, and “suggested.” Wait, “suggested”? Yes, that’s a type of privacy in which an illusion of intimacy and separateness is created with light or low screening that doesn’t really hide anything from view, but rather suggests the space is set apart from the rest of the landscape. Knowing which level of privacy you’re looking to achieve will help you focus on appropriate designs and materials to create that specific effect. Start by determining the areas of your property that need the most privacy and then work your way to the areas needing the least – places that require only a suggestion of privacy. When you divide up these spaces by privacy levels, it helps narrow fence design choices and materials for each of them. 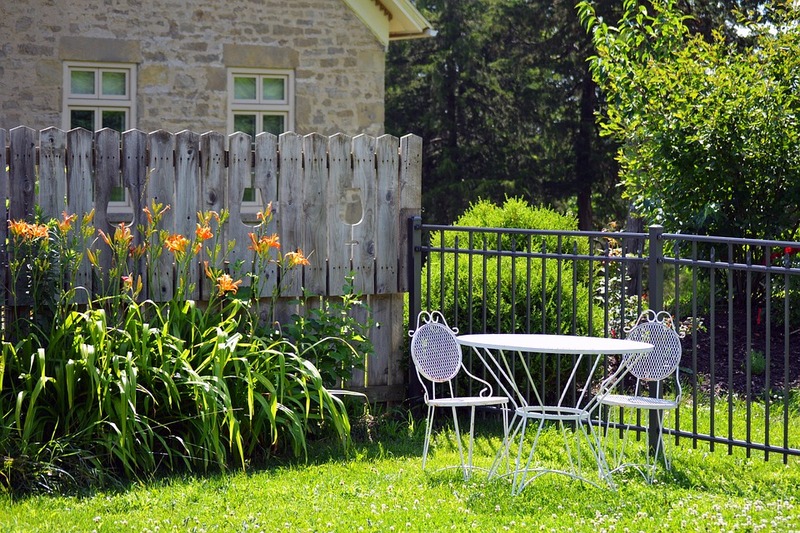 Use appropriate fencing designs and materials for the level of privacy required. You may find it surprising that fencing is available in an almost limitless variety of styles and materials, if you consider privacy levels and think creatively. For example, depending on the level, think about an artful blend of fencing, hedging, mixed boarder plantings, and even focal pieces such as natural formations. By mixing and matching elements and materials you can create a privacy screen without building a barricade. Don’t use fences as walls when plants will do. Just like lawns, fences can be a kneejerk reaction. In some cases, homeowners throw up a fences as tall as 6 or 8 feet as a wall to achieve privacy and the result is never what they imagine. Humans inherently don’t like walls outside because they create a sense of being blocked out or hemmed in, both of which can leave an individual feeling uneasy and even imprisoned. If you have an area in which you want the most privacy possible, consider carefully if a fence, or a real wall is your answer. Maybe using a thick evergreen hedge as your fence will achieve more in the way of comfortable privacy than any structure could. Match the fence height with the level of security and privacy needed. Families with children and pets have different security needs depending on their sizes and ages (kids and pets!). If you need to simply establish a boundary or barrier to contain them, consider installing low, relatively open fencing that provides good lines of sight to keep your property feeling as open as possible. In areas where more privacy is required and you don’t have the room to plant a thick or mixed planting, raise the fence to five or six feet so that when you’re sitting down you can be out of view. Perspective is critical when you’re trying to achieve privacy at different levels. A fence that screens you when you’re standing in your yard may put your breakfast nook in full view of the neighbors because even the ground floor of a house may be three, four or more feet above the ground outside. Likewise, no acceptable fence will block the view up to a second floor window. If you don’t want your neighbor to see you while you stand in your bedroom window getting dressed, consider planting leafy deciduous trees such as a sugar maple, river birch, or elm tree, whose crown will effectively block a second floor view. Don’t try to block sound or wind with a fence alone. People are often surprised that fences don’t block traffic noise or a pesky northeast wind. Airflow science reveals that moving air will flow up and over a fence and actually gain speed on the other side. The unfortunate result is that the fence not only does not block wind, it actuallyamplifies it! Sound, too, easily penetrates most fencing. A more effective solution is to add a mix of evergreen and deciduous plants on either side of the fence to absorb sound.